“It’s great. There’s really good information,” says Dolores Judkins, who flew across country to attend a first-of-its-kind event at the National Library of Medicine. 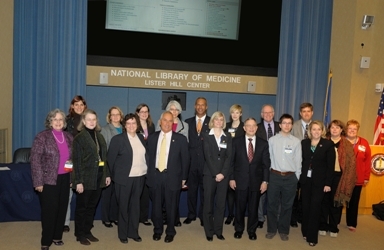 NLM held a Disaster Information Outreach Symposium, highlighting the fast-changing role of librarians and information professionals in providing guidance and resources in emergency and disaster management situations—a role that increasingly is being shaped by today’s rapid advances in mobile technology. Some 20 speakers and more than 200 participants from 29 states attended the event March 29-30, while another 250 people watched the live videocast, (which is archived and available for viewing: Day 1; Day 2). The symposium was organized by NLM’s Disaster Information Management Research Center (DIMRC) , established in 2008 to provide critical information resources and tools for disaster preparedness, response and recovery. “The symposium gave information professionals active in disaster information a unique opportunity to present their research, projects, and expectations for next steps to their peers,” says symposium chair Cindy Love, a medical librarian with DIMRC, and head of the Library’s disaster information specialist program. Dr. Lurie was followed by speakers from federal and state government, the military, academia, hospital and university libraries, and volunteer organizations who discussed their experiences and presented research on a variety of topics ranging from the role of social media in disaster response, the information needs of emergency responders in disasters and public health emergencies, using library facilities and resources, and the role of librarians in disaster preparedness, response, and recovery. Speakers and attendees were a mix of librarians and non-librarians. Grace Lee, a fellow at the Centers for Disease Control and Prevention, said she came to the symposium to “learn about information management from a librarian’s perspective” to conduct disaster-related research for her fellowship. Attendees said they appreciated the diverse agenda, and the opportunity to learn from people who’ve been on the front lines during disasters. For example, Laura Howe of the American Red Cross, talked about the use of social media during disasters. David Yates, PhD, an assistant professor in the College of Information Studies at the University of Maryland and a member of the U.S. Air Force Reserve, talked about his Reserve experience handling information and communications in an operations center at Pentagon after the Haiti earthquake. Diane Brown, Deputy State Librarian at the State Library of Louisiana, who lived through both Hurricanes Katrina and Rita in 2005 and was deeply involved in the recovery efforts afterward, discussed using library facilities and resources for response and recovery. People attending the symposium had the opportunity to talk with speakers and a variety of exhibitors from government and community organizations involved in disaster preparedness and response. The youngest exhibitors were from Girl Scout Troop 5127, part of the Girl Scout Council of the Nation’s Capital. They told NLM Director Donald A.B. Lindberg, MD and others about the Council’s new Emergency Preparedness Patch Program, which teaches Girl Scouts skills to use in the event of a disaster. Information compiled by Thomas Conuel, NLM in Focus writer, and Shana Potash, NLM in Focus editor. 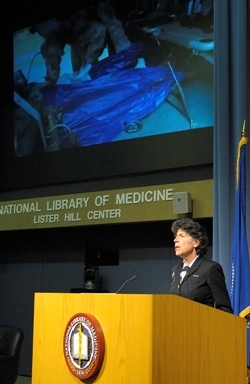 Top Photo: Nicole Lurie, MD, MSPH, Assistant Secretary for Preparedness and Response, HHS, gives the keynote address. Photo by: Michael Spencer. Ana Cleveland, Isabel Lopez, Lisl Zach, Diane Brown, Cindy Love, Alicia Livinski, Steven Phillips, Barbara Folb, John Koerner, Stacey Arnesen, Robin Featherstone, Kenneth Schor, Dan Wilson, Gabriel Brandt, Edward Metz, Laura Howe, Mary Moore, Patti Reynolds. Not in photo: Nicole Lurie, Cynthia Henderson, David Yates, Ruth Holst, Lisa Koonin, Gale Dutcher. Photo by: Michael Spencer. Bottom Photo: NLM Director Donald A.B. 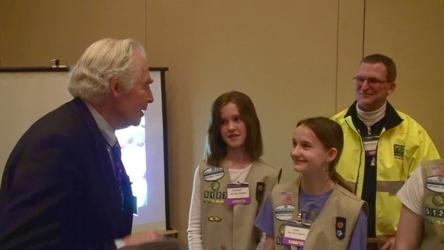 Lindberg, MD, visits with members of Girl Scout Troop 5172, exhibiting at the symposium. Photo by James C. Charuhas.